The past few weeks have been a blitz of activity. Two very special people Jerry and I met on our travels to professional conferences in California and Canada came to visit. Both brought hearts brimming with love and concern for our Ranchers, and heads simply bursting with ideas. A week ago this evening, Daniela and her friend Nora arrived. Daniela is a geriatric social worker in Oregon and we met her, of all places, on a ferry from Seattle to Vancouver. Daniela has a son with autism, so we had things to talk about right away. One thing led to another and she told me of her background in Czech and Polish folk art, most especially the elaborate wax-resist eggs that are famous around the world. 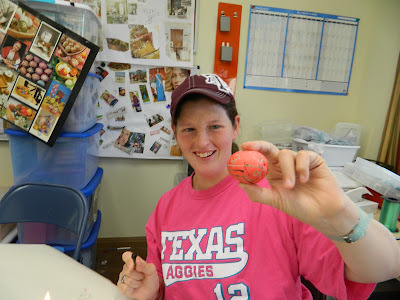 Not leaving anything to chance, Daniela brought all her supplies, from the dye to the eggs to the wheat for weaving and her paper cut-out examples--and not forgetting the vinegar, the wax, the styli--all in a large suitcase! On Friday we spent a day with our Ranchers exploring these beautiful crafts. Rebekah exclaimed as she drew on her first egg with the wax stylus, "I'm making an egg! I'm making an egg!" When she saw the magic unfold as the wax was melted off and the colors she'd laid down appeared, she shouted for joy. "I want to do another one!" All in all, the workshop was a great success, and about half the Ranchers participated. Then this week on Tuesday, Cantor Steve arrived from southern Cal. We'd met at the FReD Conference of parents wanting to build a farm or Ranch for their children with autism. Cantor Steve believes that spirituality is the neglected step-child when it comes to the disability community. "I can't believe anyone in the world would be happy with the idea that everybody and everything they do comes at you with the intent of fixing what's wrong with you! How would we like that? Why don't we work with their interests and talents?" As a result, Cantor Steve has undertaken to prepare young men for their bar mitzvah ceremony. Ungovernable boys have settled down under his tutelage and learned the tenets of their faith. "One boy," he said, "had some fairly disturbing ideas he would talk about. We would discuss how the things he said he wanted to do did not fit with the actions of a good Jewish man, that they are things that are against our rules. Over the course of our work together, he completely reversed his focus. He became very interested in asserting his rightful place in his faith community." As one young man's mother said, "Our son will always have the day of his bar mitzvah to remember. We couldn't believe the change in him, what he accomplished, how Cantor Steve got him to settle down and do the work." So, naturally I wanted to take advantage of Cantor's presence, and invited him to help with Bible study this morning. We've taken on the Ten Commandments, or as we refer to them, the "Ten Rules for Living." Cantor Steve and I had been talking about the parting of the Red Sea, and he'd told me about the midrash explanation that a man named Nachshon, with the pursuing hordes of Pharoah's army approaching from behind, and facing the Red Sea in front, stepped out in faith into the water. As Nachshon advanced into the sea, the water level rose to his waist, then to his shoulders, and finally covered his face and head. At that point God ordered the waters to part, responding to Nachson's faith, and all the people followed. 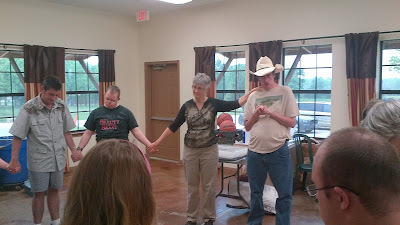 During Bible study we talked, had a prayer circle, sang songs, and acted out Nachshon's courageous act. As Cantor and I reported to Jerry later, it was a regular Texas country interfaith revival! All that was missing was the tent. As to why Cantor Steve came to visit in the first place, that's easy. 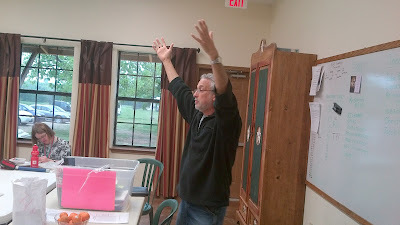 He envisions helping parents of kids with special needs, like us, build that home in the garden like Down Home Ranch. Like Nachshon, he's prepared to take that leap of faith, follow his dream, and hope the money will follow. He's divested himself of home and possessions, and will soon move onto borrowed land in a modest mobile home. Hmmmm, something about that story reminds me of a couple with a wee girl with Down syndrome, who moved into a little mobile home in the middle of nowhere and named it "The Mustard Seed."